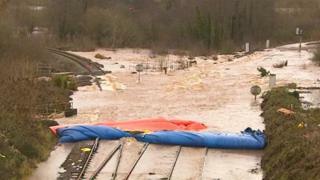 Plans to protect Devon and Cornwall's main rail line in Exeter from repeated flooding have been announced. Network Rail has named its preferred solution for tackling flooding at Cowley and Stafford bridges in Exeter. Flooding has resulted in four weeks of disruption over the last two years resulting in delays and closures, loss of profit for businesses in the area and inconvenience to residents. Business leaders said the work was "long overdue". Network Rail said it planned to dig out three weirs and dredge the River Exe to improve its flow and a new culvert would be built to divert floodwater. It also said that new embankments would be constructed to reduce the risk of the river bursting its banks. Network Rail said such flooding should only happen once every 20 years. The plans were unveiled at a meeting of the Peninsula Rail Task Force where Network Rail said the work would cost around £15m and start at the end of 2015. Tim Jones, from the Devon and Cornwall Business Council, said the work was "welcomed" but "long overdue". "We've got to have some pain before we get the gain, but this is too long," he said. "This is a vital part of our infrastructure. Rail travel is crucial to the local economy; a lot of business people use that route and they've been unable to do that on a regular basis. "There's no consistency in the travel and this disruption will continue to happen until this investment is completed." Joanna Grew, from Network Rail, said: "We are now working with the council and other stakeholders to gather their views on our proposal and will keep the local community updated on our progress."